Complete the Departmental Resource Calendar Request Form with the information below to request a Resource Calendar. Department ID: This is the abbreviation or acronym for your Department eg. Western Technology Services Department ID is "WTS". This ID will preface all of your department resource calendars. Seating Capacity: The seating capacity of meeting rooms can now be specified when the calendar is created. 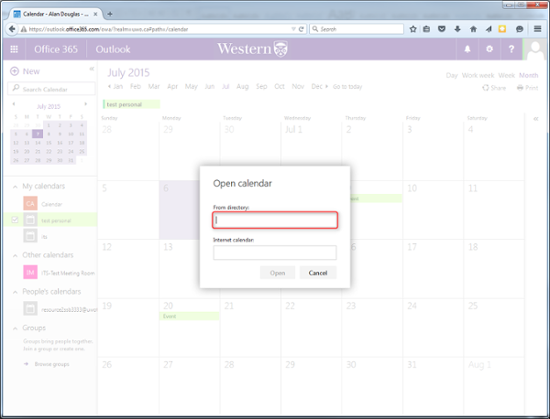 Calendar Owners: Please specify the UWO User ID's of the Owners of the resource calendar. Membership: By default, Department Resource Calendars will be accessible by everyone in a Department. If you require a resource calendar only for certain individuals or a subset of your Department, then we will need a list of UWO User ID's for all the requested members. Membership: Membership to a Resource Calendar is now controlled through Western's Active Directory structure. Requests to add or remove individuals or modify resource calendar permissions must be submitted to Service Desk. Double Booking: Resource Calendars do not allow for double booking by default. This behaviour can be changed upon request. Check Availability: Resource Calendars are automatically set to "Busy" upon being invited to a meeting. This is to help avoid double-booking a resource or room. Booking in Advance: Resources by default can be booked 365 days (One Year) in advance. This timeframe can be changed upon request. Receiving notifications from potential invitees as to their intentions to attend the meeting. Resolving scheduling conflicts can be difficult because no one knows who to approach about changing a time or room. Free/Busy information in Office 365 is composed of 2 separate but related parts: Free/Busy Information and Presence. Free/Busy is tied to your Presence and vice versa, but they are separate features. Free/Busy indicates your availability in the future, whereas Presence indicates your status at that moment. 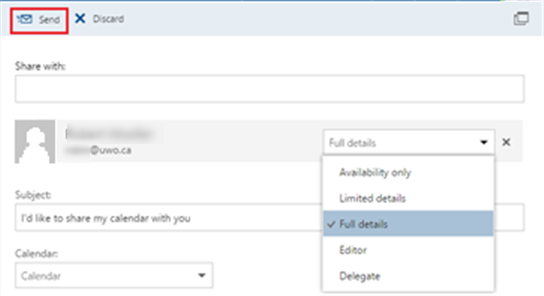 Free/Busy and Availability in Office 365 is controlled primarily through your Calendar. Your Free/Busy status will change automatically based on your existing Calendar appointments e.g. if you're in a meeting, your Free/Busy and Presence information will show "Busy". Users have the ability to restrict who else can see their Free/Busy information. 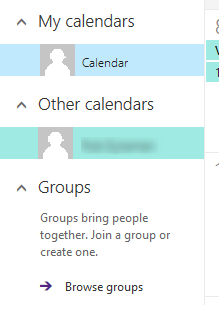 Presence is always displayed unless you are signed out of Skype for Business and the Outlook Web App at the same time. Some users may wish to restrict who can see their Free/Busy information. This can only be done from a full Desktop client such as Outlook 2013. Change the Permissions dropdown menu to say "None"
Enter the Email Address of the person you wish to share your calendar with in the “Share with:” field. Choose what permissions they have using the Permissions dropdown box. There are multiple ways a meeting can be booked utilizing a Resource Calendar. Pick the method you are most comfortable with. Invite the Resource Calendar as an Attendee, the same as in Convergence. Calendars addresses are in the format of CAL-Department-Building-Room@uwo.ca (ex. CAL-ITS-SSB-3333@uwo.ca) and can be found by entering your Department code (ex. WTS) and clicking the Check Names button. Click the drop-down menu for Location. Any resource calendar you have previously booked will show up. Click the Rooms button. You will see a list of every available resource calendar, sorted alphabetically. Click the drop-down under "Show a room list" and select the room list for your department. You will see just the resource calendars in your department. Please note WTS is in the process of creating room lists, so one may not be present for your department yet. NOTE: Outlook keeps track of time zones and daylight saving time so that events automatically appear at the correct time on your calendar. 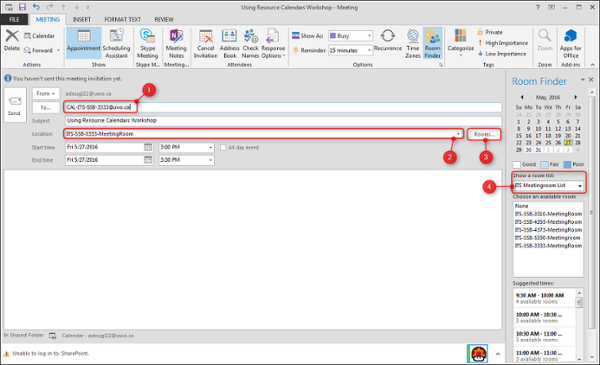 When you create a new meeting or appointment, Outlook uses the default time zone in your Outlook preferences for Calendar. You can specify a different time zone for an event as you are creating it. To display the Time zone selector, on either the Organizer Meeting tab or the Appointment tab, click Time Zones. Invite the Resource Calendar as an Attendee, the same as in Convergence. 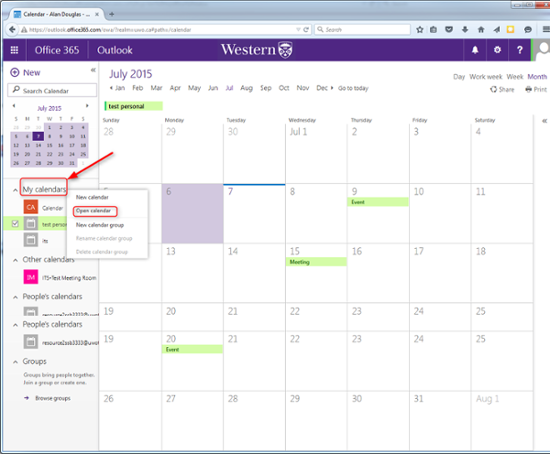 Calendars addresses are in the format of CAL-Department-Building-Room@uwo.ca (ex. CAL-ITS-SSB-3333@uwo.ca) and can be found by clicking the + button next to Add People, entering your Department code (ex. WTS) in the Search People box, and clicking magnifying glass button. Step 2 – Right Click on “My calendars” on the left. Click Open Calendar. Step 3 – Enter the email address of the person whose calendar you wish to subscribe to in the “From directory:” box. Click Open. You can give anyone within your organization editor or delegate access to your calendar. You can't give editor or delegate access to people outside your organization. Sign in to Office 365 from https://myoffice.uwo.ca. Select Calendar --> Share. In the Share drop-down box, click Calendar. In the Share with box, type the name or email address of the person you want to share your calendar with. After you've added the person or people whom you want to be able to manage your calendar, click the drop-down box to the right of their name, and select the level of access you want them to have. Select Editor to give them permission to make changes to your calendar. Select Delegate to give them the same permission as an editor, plus be able to send and respond to meeting requests for you. The options Full details, Limited details, and Availability only, allow others only to view your calendar, not make changes to it. After you've finished adding colleagues with whom to share your calendar, set their access levels, and have chosen which calendar to share with them, select Send. If you decide not to share your calendar right now, select Discard. NOTE: If you're sharing a calendar other than your primary calendar, such as a project calendar that you've added to your account, you can give permission only for Full details or Editor access to that calendar. The people you share your calendar with receive an email message telling them about it. The message invitation includes two options: one to add your calendar to their calendar view, and another to share their calendar with you. When your colleague adds your calendar to their calendar view, your calendar will be added to Other calendars. NOTE: Calendar items marked Private are protected. Most people you share your calendar with see only the time of items marked Private, not the subject, location, or other details however you can give a delegate permission to see the details of items marked Private. Once you've given someone delegate access to your calendar, you'll see an additional option under Calendar permissions that lets you control how meeting requests and responses are processed. 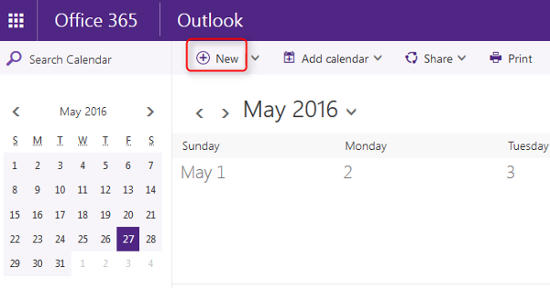 Go to your Calendar in Outlook on the web for business. Go to the calendar navigation pane, and under My calendars, right-click Calendar. Delegate only. Send me notifications. Meeting requests and responses are sent to you and your delegates. Only your delegates see the option to accept or decline a meeting request. Delegate only. Meeting requests and responses go only to your delegates. Both my delegate and me. Meeting requests and responses are sent both to you and your delegates. Select Save to save your changes or Discard to cancel. You can use the calendar permission settings to give delegates permission to see the details of items that have been marked as private. Select the person you want to give permission to see private appointments. If they don't already have delegate access, you can give them that permission now. Select Allow viewing of private events. Note: If you are trying to assign Edit permissions to someone, share your calendar using the steps for Outlook Web Access. Send the HTML link to people to allow them to view your Calendar in a web browser. Send them the ICS link if you want them to be able to subscribe to your Calendar. Please note that the ICS link may only work for other Office365 or Outlook users. Office 365 users are recommended to create a calendar sharing link. Users who visit your calendar sharing link will be able to view your Calendar in a webpage. This will allow users still in Convergence to view your Free/Busy information. Using a Doodle Poll is another method for Office 365 users to check free/busy information for Convergence users. A Doodle Poll is a free online scheduling tool that can be used to facilitate scheduling a meeting with a group of people. You select a number of potential times and send the poll to the people you wish to meet with. They select all the times they are available, you can then use this information to book a meeting at the appropriate time.